Strong, cheap, small. High multimedia performance in a small case - plus looks for stylish boasting. 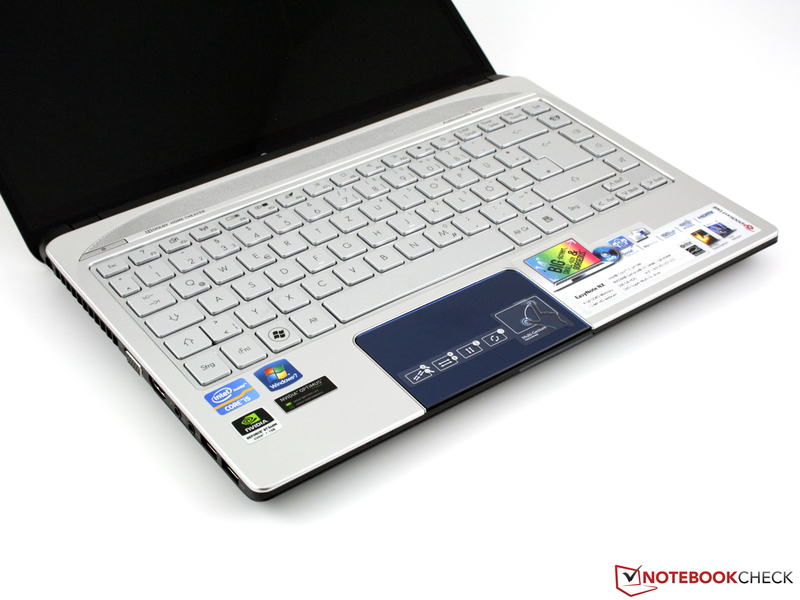 The manufacturer has set up a remarkably high-end almost-subnotebook for less than 700€. 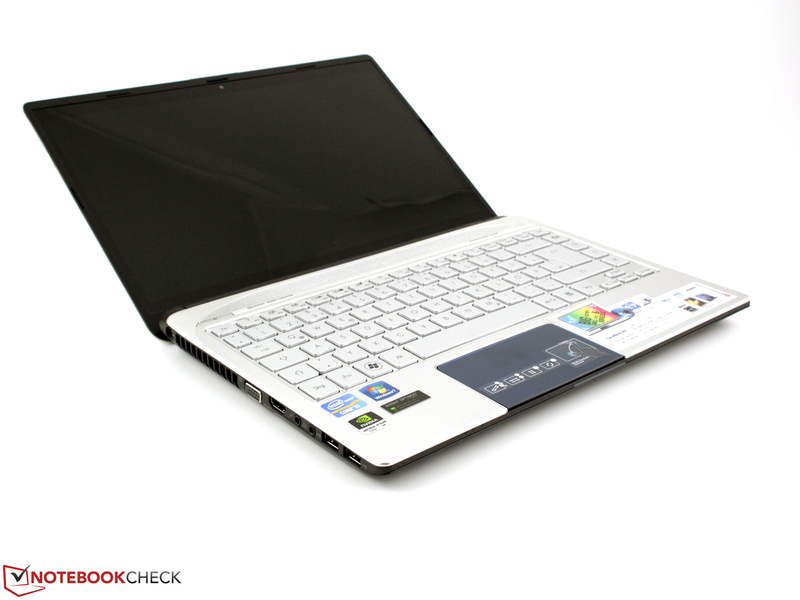 The small 14 inch laptop from the Acer subsidiary, Packard Bell, caught our eye for the first time at the IFA 2011. The device was already available in online shops at the time. The first thing that strikes you: The 14 inch screen, framed by a thin bezel, is in a 13.3 inch case. Here, the manufacturer has exploited the maximum display dimension. But the NX69 is not just a dazzler. The spec sheet wakes curiosity in view of the price considerably under 700€. Intel's Core i5-2410M beside Nvidia's GeForce GT 540M even makes the 14 incher efficient and a strong gamer. Learn about the advantages and disadvantages that we discovered on the Packard Bell NX69-HR-127GE in our comprehensive review. 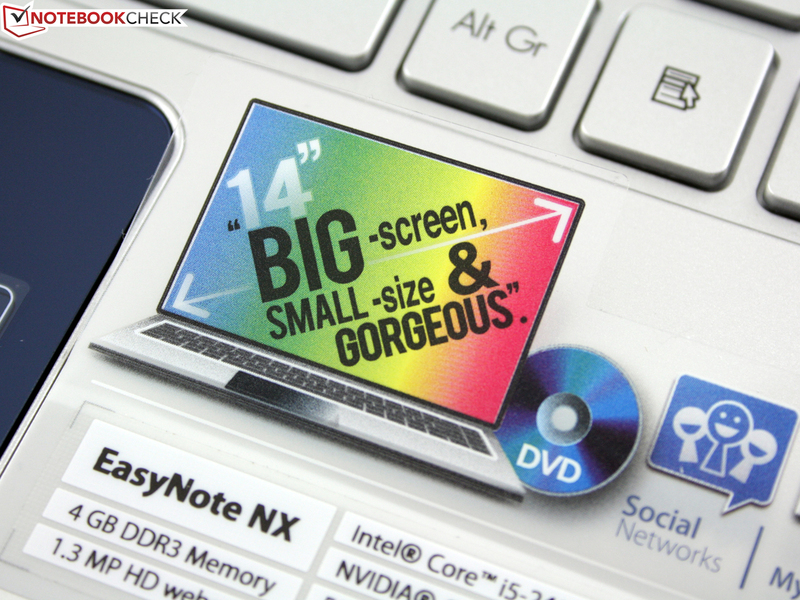 Those who want to show off a bit with the EasyNote NX69's high-end looks will be satisfied. The matt surfaces make a workplace suitable and at the same time elegant impression. The 14 incher is presentable during customer contact on the one hand, and can be shown off privately on the other. We can't give the NX69 the title "lightweight". Nevertheless, with 2089 grams (4.6 lbs) plus 391 grams (0.86 lbs) for the adapter, the 14 incher is 300 grams (0.66 lbs) lighter than an Asus X43SV (14") or 50 grams (0.11 lbs) lighter than an Aspire 4830TG. The weight is quite high for a 13.3 incher - and this is exactly the case size that we are dealing with. 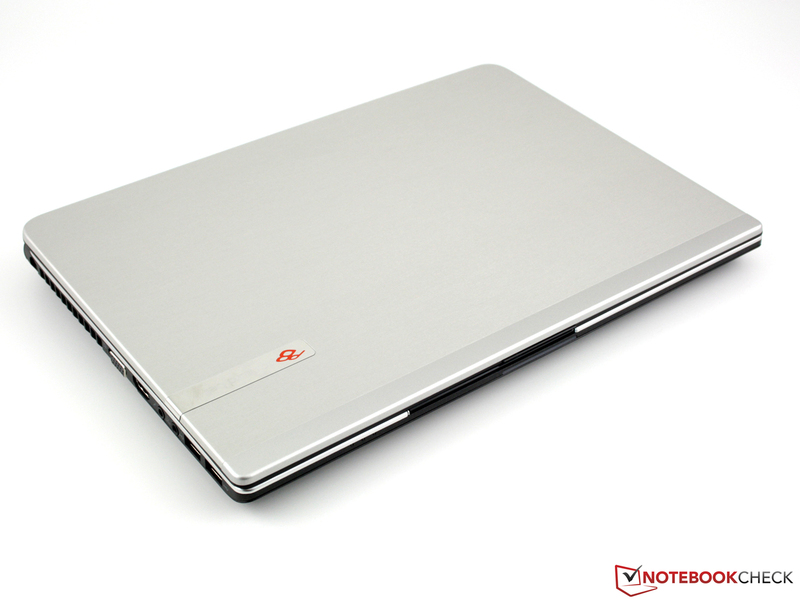 Dell's Vostro V130 (13.3") that is completely clad in aluminum was considerably lighter with 1.63 kilograms. An Aspire 3830TG only weighs 1.89 kilograms (3.5 lbs). But we're not upset about the Packard Bell's weight because a long-lasting (built-in) 6000 mAh battery simply has its high weight. 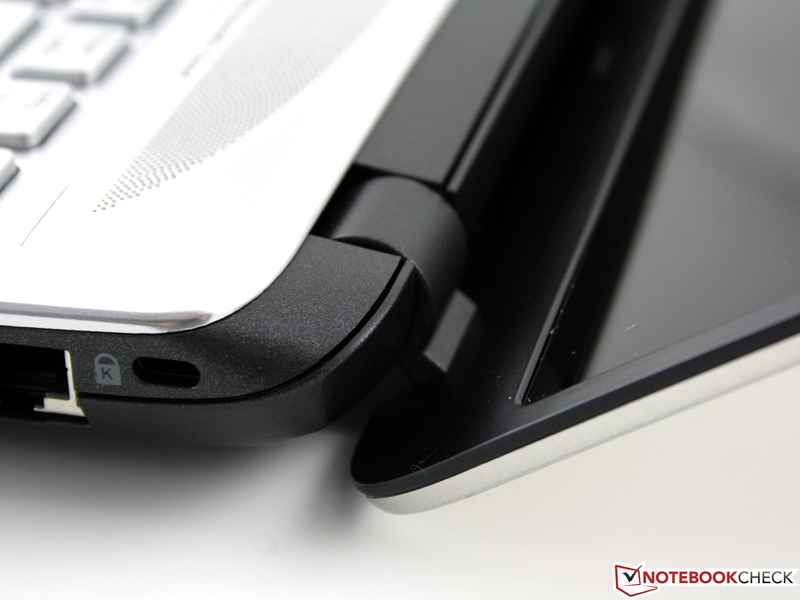 The user will take delight in the high-end surfaces of the case. The hinges have a tight and secure hold on the lid and don't tend to teeter. The maximum opening angle of about 150 degrees is perfectly suitable for lap-top use. Only one hand is needed to open the lid - the fairly heavy base unit stays on the table all by itself. We can only twist the base unit a bit when taken into both hands at its sides. The plastic base plate doesn't have any openings, not even for the RAM. This is unfavorable for upgrading, but very favorable for the base unit's compact stability. Pressure can only induce denting in the optical drive's area. The wrist rest and touchpad prove to be very rigid. The hands don't slip on the big surfaces and don't leave any fingerprints on the silver finish. 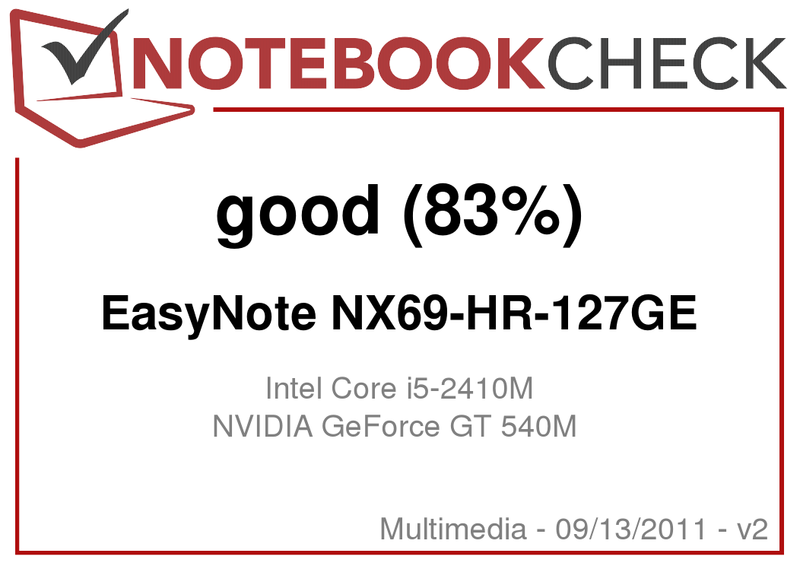 Interfaces aren't one of the EasyNote NX69's strengths. 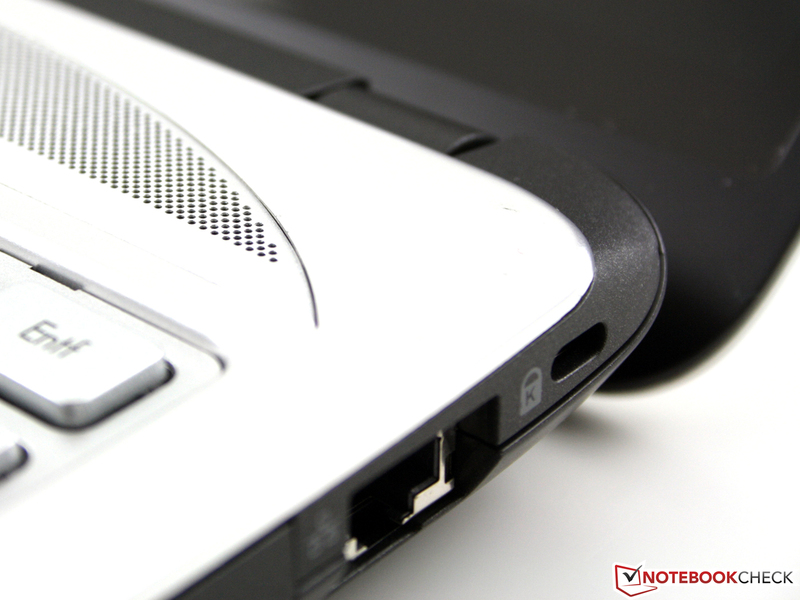 The three USB ports, one of which is USB 3.0, are sufficient for printer, mouse or USB hard disk. eSATA, ExpressCard34/54 or even a docking port isn't installed. External monitors can be connected via HDMI or VGA. The positioning can't counter the cable mess on the desk. The unwieldy HDMI and VGA cables are unfortunately in the left front area. The cables could consequently get in the way of a left-handed mouse. At least the Ethernet port is located in the far back right so that cables can easily be led away from the work space. Regrettably, the USB 3.0 port is on the right's far front. External hard disks or other USB 3.0 peripherals that are permanently connected will collide with a right-handed mouse. In addition to WLAN draft n (Atheros AR5B97), Bluetooth 3.0 +HS is also installed into the NX69 as wireless technology. The Atheros AR8151 Gigabit Ethernet controller can transfer data in the highest possible speed. An internal HSPA module for mobile Internet access would have been the highlight. There are no recovery DVDs for Windows 7 Home Premium (64bit) included. Thus, buyers should create their own image data carrier with MyBackUp. 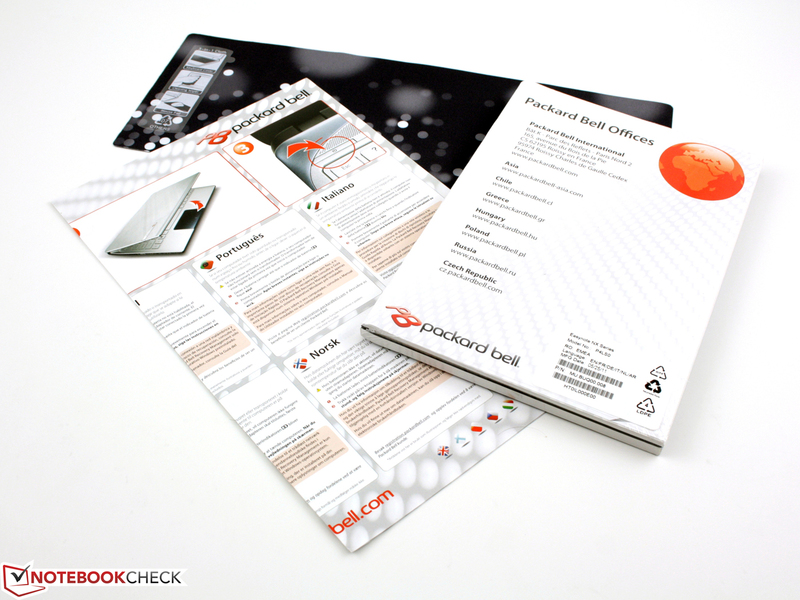 Packard Bell notebooks include the full version of Adobe Photoshop Elements 9 as usual. Nero 9, a complete package for burning DVDs/CDs and simple video and picture editing, is also included. Social Networks is an application for accessing Facebook, YouTube or Flickr all at once. The keyboard has its own key for starting this program. 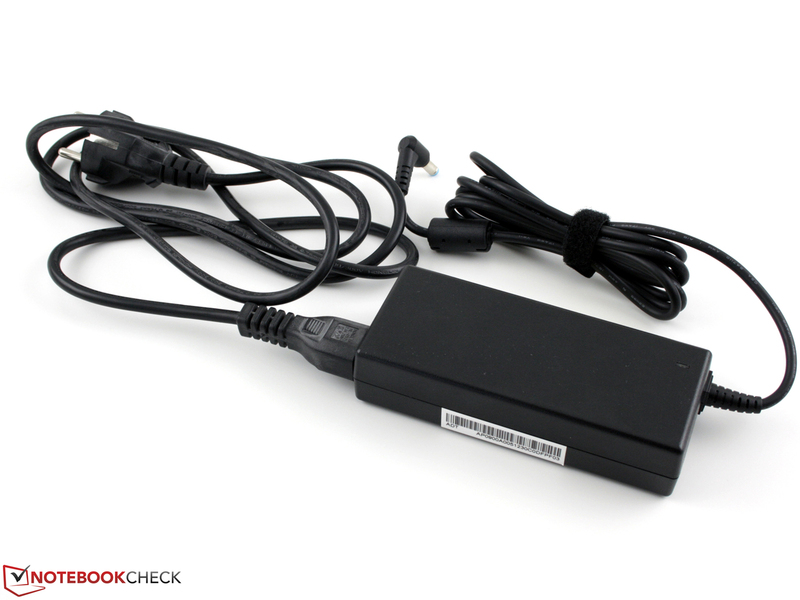 Mobile devices, such as smartphones or hand helds, can be charged via the USB 3.0 port without having to turn on the EasyNote NX (charge icon on the port). The manufacturer's warranty is 24 months. The warranty extension PB Care Note is a 3 year warranty that can be purchased for 69€. It includes accidental damage insurance. Additional fees for shipping, labor and parts are thus covered. The notebook will be picked up. The separated keys are in a matt silver plastic bed. 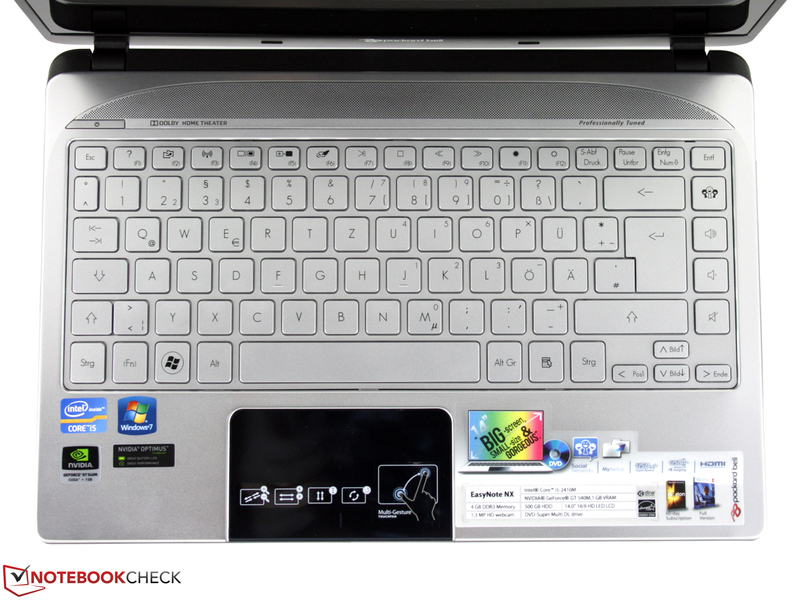 Pressed keys are level with the surface, which makes cleaning easy. Since there is no numpad, the layout is generous. The enter, space and backspace key are very big and the arrow keys are clearly separated from the others. The volume buttons and social network key are located at the far right (opens these applications). Regrettably, the keys have a spongy stroke and a smooth surface (but a clear pressure point). The key drop is medium short and the keyboard coils during vigorous typing. All in all, the keyboard supplies an inaccurate feedback. Although the mouse pad (Synaptics ClickPad V8.0) doesn't have a visible right and left mouse key, they are located below the pad's surface. The front pad area tilts downward when tapped and stops with a quiet click noise. Fast clicking is a bit difficult because of the short key drop. The surface is very big (11.2 cm / 4.4") and sensitive up to its edges. The surface is very smooth and only bids a slippery scroll resistance. The vertical scroll bar (one finger control) is directly on the "mouse keys", so in the lowest part of the entire surface. This is pleasant because we can orientate ourselves on the lower edge. There is also a horizontal scroll bar available (both disabled in default settings). 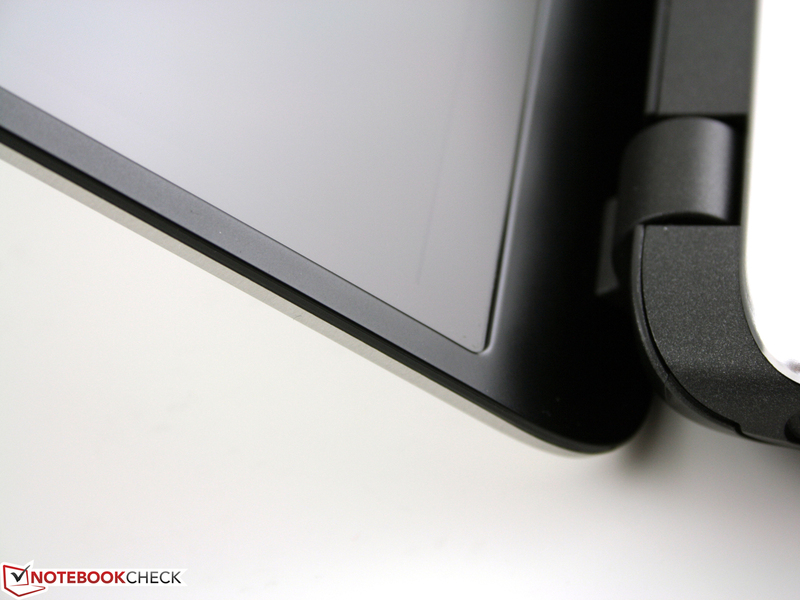 The ClickPad allows full gesture control in multi-touch manner. 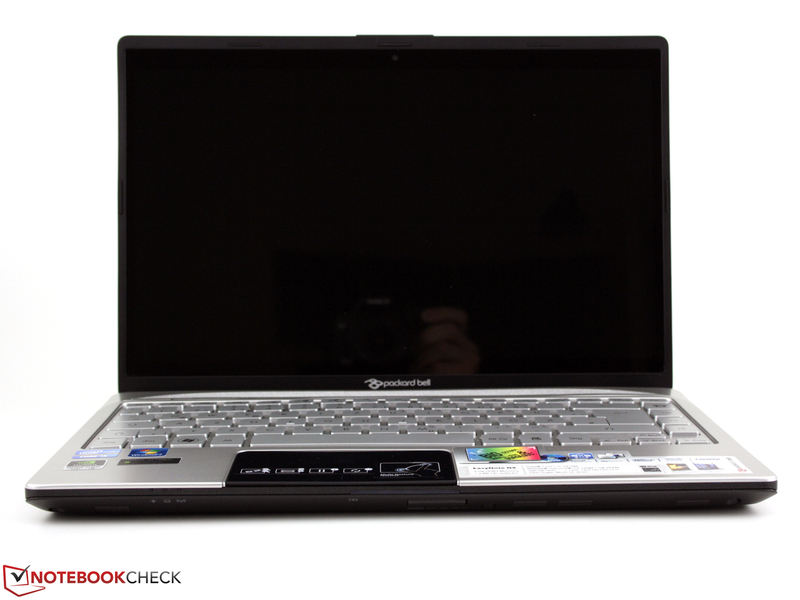 Packard Bell builds in a 14 inch screen (35.6 cm) with a resolution of 1366x768 pixels (HD, 16:9). Due to the narrow TFT frame's build, which is made possible by a thin plastic plate in front of the screen, the NX69 only has the dimensions of a 13.3 inch device. Devices with a wide bezel usually have a screen diagonal 13.4" (33.8 cm). The glare-type screen (model: LP140WH6-TJA1) can't convince us. The brightness is average, the contrasts are low and the color spectrum is narrow. Together with a black value of 1.44 cd/m2 we assess a contrast of 140:1. A higher contrast would yield intensely bright colors if the glare-type wouldn't prevent them from looking dull and pallid. The color spectrum is narrow, like the measurement with the color calibrator X-Rite i1Display shows. AdobeRGB (t) and sRGB (t) aren't even close to being covered. The higher quality 16 inch screen in Sony's Vaio F22 FHD (t) proves that this is possible. Professional graphic designers might be deterred by this fact, but it won't bother the end user much. We measure an average of 196 cd/m2. The luminance meter records a maximum of 208 cd/m2 in the upper right. In view of the intended mobility, a brightness rate beyond 300 cd/m2 would have been desirable. Samsung shows this ideally in its Series 9: 900X1B & 900X3A. The 14 inch TFT is not the perfect companion for the balcony or roof garden due to its reflective surface and only average brightness. We experience annoying reflections even in overcast conditions that can only be eliminated by shading. The horizontal viewing angles are fairly good. We can read script up to a deviation of about 40 degrees from the front. The displayed script stays legible up to about 40 degrees when our view sways downward (vertically). However, colors already start to clearly invert at 10 degrees (ghosting, color inverting). 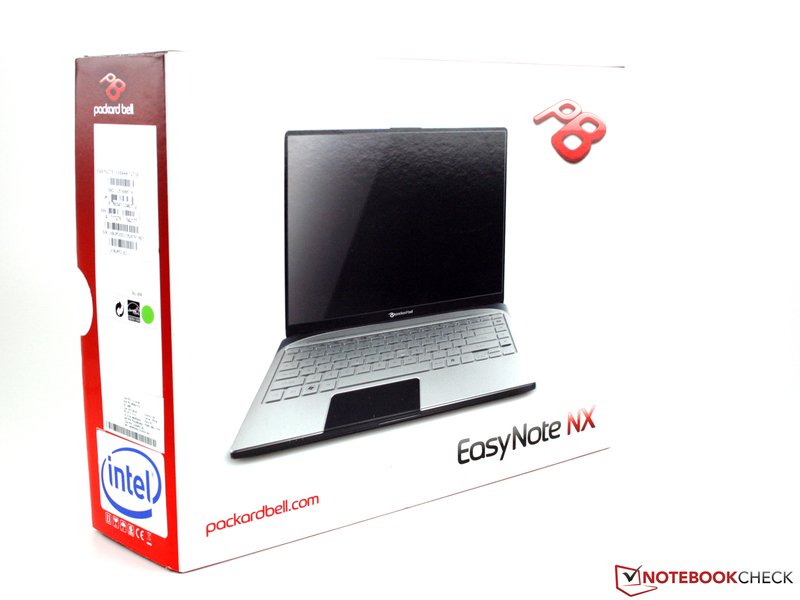 Packard Bell installs an Intel Core i5-2410M processor into the EasyNote NX69-HR-127GE. The dual core processor from Intel's current Sandy Bridge family is the run of the mill CPU found in many laptop models at the moment. The midrange processor with a default clock rate of 2.3 GHz can provide a slight performance increase with Intel's Turbo Boost 2.0. Thus, the processor can be overclocked when required. The clock is lifted to 2.9 GHz when only one processor core is needed (two cores: 2.6 GHz). Providing the cooling is sufficient, the CPU can also be clocked higher than specified (>2.9 GHz). However, we didn't observe that in this slim case (limited cooling performance). The graphics chip, HD Graphics 3000, is embedded into the processor (650 - 1100 MHz). This allows the use of Nvidia's Optimus in connection with the Geforce GT 540M. The HDD bay is fitted with a Western Digital WD5000BPVT-22HXZT1 (500 GB; 5400 rpm). To achieve the Turbo clock beyond 2.9 GHz (single core / Turbo 2.0 feature), the cooling has to have enough reserves. The Core i5-2410M (2x 2.3 GHz) calculated consistently with 2.8 to 2.9 GHz in single core applications in our tests (e. g. SuperPi). The clock remained constant at 2.7 GHz (4x 2.693 MHz because 2 virtual HT cores) in multi core (WPrime or Cinebench). See screenshots. The CPU thus reaches the typical rates for a 2410M in the framework of all tested laptops: SuperPi: 739 seconds; Wprime: 587 seconds; Cinebench R11.5: 2.57 points. 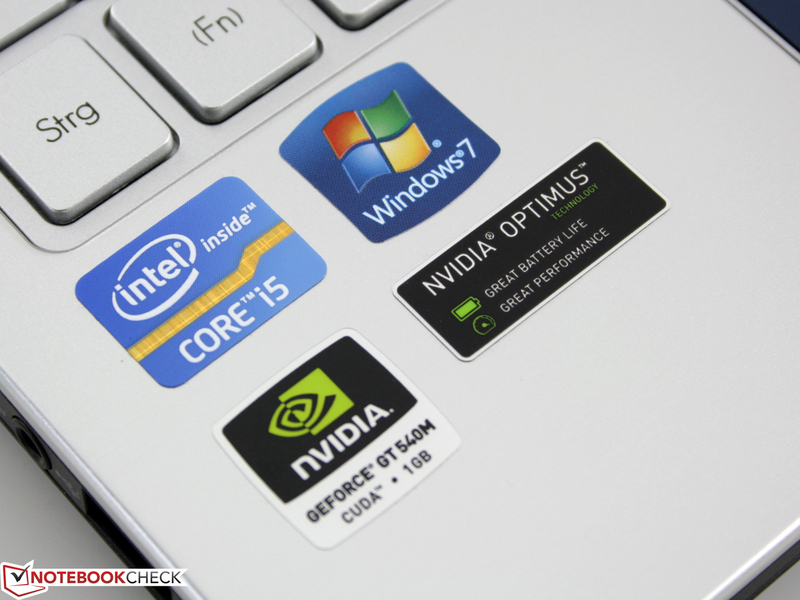 Is the i5-2410M sufficient or should you look around for a bigger laptop with a quad Core i7 2630QM (4x2.0 GHz)? While the latter isn't available in 14 inches, it can be found in 15.6 inch laptops for starting at 660€, e. g. Samsung RC530 with a GT 540M. The 2410M manages 3.623 points when processing on one core. A 2630QM manages an average of 3649 points (Cinebench R10 single 32 bit). The quad core doesn't have an advantage here. That's different in Cinebench R10 multi 32 bit. The i5-2410M (4 threads) achieves 9762 points. A 2630QM (8 threads) reaches 13622 points (+29%). The former single core calculation is hardly ever important for routine work. If you can benefit from multi thread computing power (e. g. video rendering, image processing), you'll be better off with a quad core. The relatively low difference of 29% can be neglected in case of doubt. The quad core doesn't bring any advantages for games that are currently on the market. PCMark Vantage also shows that the difference can be ignored. A click on "in comparison" shows many quad core machines with a similar score. In the newer PCMark 7 that exploits the four physical cores better, the quad's advantage is only 11 percent (2073 points, Samsung RF511, GT 540M, 5400 rpm HDD). The GeForce GT 540M's 3D performance (1024 MB DDR3) is barely ever slightly below the usual level. The clock of 672/900 MHz (core/memory) corresponds to the standard specs. 3DMark 2006 (1280x1024) finishes with 7806 points - a typical score for this CPU-GPU configuration. The 3DMark Vantage score of P3829 is however below most GT 540M test devices with the same CPU (~P4150). Unigine Heaven (CPU independent) finishes with 13fps, which in turn is a very typical score for a GT 540M. The HDD sub score in PCMark Vantage is 3337 points, which is also a typical score for a 5400 rpm HDD. Only fast 7200 hard disks can reach over 3500 points and leads to an increase in system performance. The hard disk (500GB) from Western Digital reads with 66.8 MB/s in sequential read. The burst rate of 74 MB/s is rather slow (read out of HDD cache). The hard disk is only heard during use when the fan is turned off in idle. And that is hardly ever the case. The write and read heads are almost inaudible during activity (quiet clacking). We tested how games run on the often tested GT 540M in this small notebook with the following tracks. The action adventure just skims past smooth playability in high details. We only measure 27 fps in the native resolution of 1366x768 pixels. This frame rate is however already pretty good for a GT 540M. The average in high details on this GPU is 24 fps. The game provides 39 fps in medium details. The twin GPU solution, Radeon HD 6680G2, only manages 30 fps in the same settings. The built-in benchmark of the race game ensures an exactly repeatable measurement. You get good frame rates in high details with 1360x768 pixels: 35 fps. Again, a typical rate. The MSI GE620 (i5-2410M) delivers 38 fps. The rival, Radeon HD 6630M , manages 36 fps in high settings (Dell Vostro 3550). The shooter can be played very well in the native resolution. You don't have to give up high DirectX 11 details: 37 fps. The test database for this game is still almost empty. The old HD 5650 managed 32 fps in the TravelMate 7740G. The crossfire configuration, Radeon HD 6680G2, manages a noticeably poorer 28 fps. The real time strategy game runs acceptably, but the player shouldn't think about using the native 1366x768 pixels and high details (4AA). The demo's mission runs at an average of 22 fps in the first few minutes. RUSE manages a better 34 fps in medium details again in 1366x768 pixels and reduced antialiasing (2AA). The games once more confirm the good to very good gaming performance of the Geforce GT 540M. This is true when the resolution doesn't exceed 1366x768 pixels. The GT 540M is too weak for high details beyond WXGA (e. g. on an external FHD TFT). However, gamers won't find a better gaming performance in a 14 inch (actually 13.3 inch) case or smaller - especially not for under 700€. A question that repeatedly turns up is if the 35 watt Core i5 and the fairly strong graphics card can be cooled without the case mutating to a heater in such a small case. 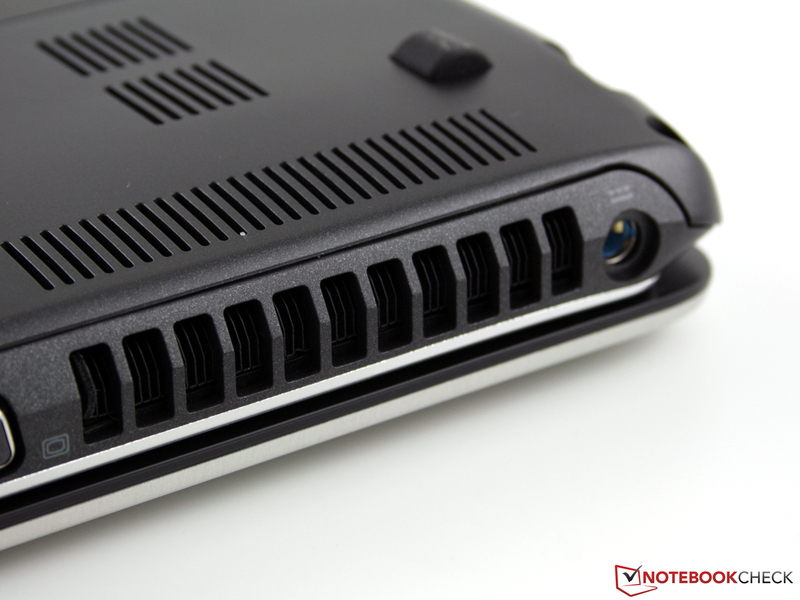 The Packard Bell NX69 even has an optical drive that takes potential cooling performance from the case. The fan runs with 30 to 34 dB (A) during undemanding use (surfing, listening to music, word). It turns itself off temporarily in long idle phases so that only the HDD's noise can be heard. 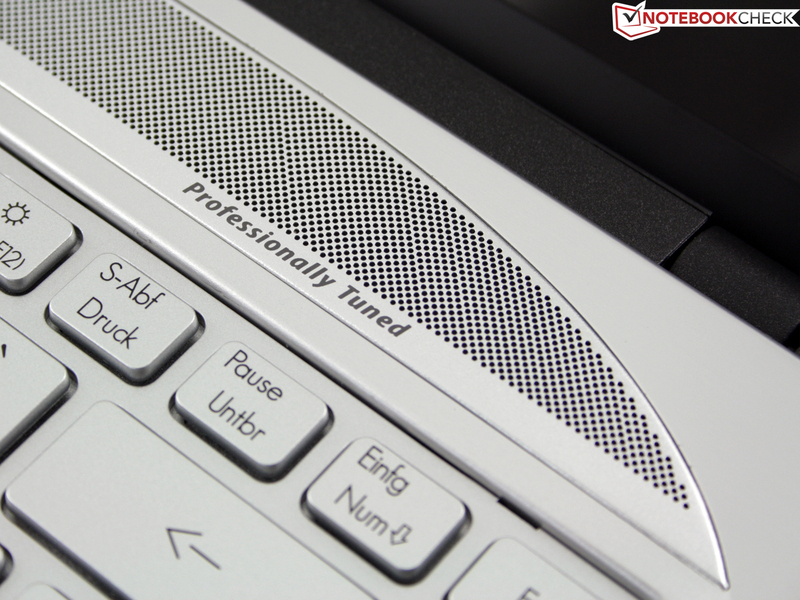 However, when the laptop is only used a bit, the level is an audible 32 to 34 dB (A). The cooling system gets as loud as 39 dB (A) in 3DMark 06. The maximum, yet constant, noise of 40 dB (A) is generated in the stress test (Furmark & Prime95). We measure a maximum of 38 dB (A) when only the CPU is stressed. The temperatures follow the noise's example - they remain fairly inconspicuous. The top doesn't exceed 35 degrees in normal use with a lot of idle. It's regrettable that the touchpad has the highest temperature. We measure up to 43 degrees Celsius on the bottom in the stress test with processor and Nvidia GT 540M. Since this is only a selective rate, the average is 34 degrees. That is a low temperature for the little case in the stress test. 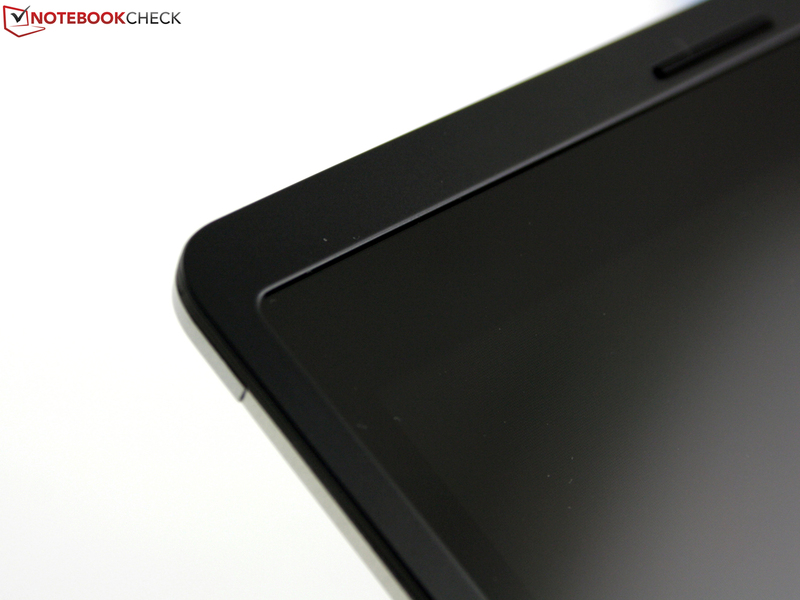 The touchpad heats up to 38 degrees during load. The CPU clock throttles to 1.2 GHz (default clock 2.3 GHz) during the stress test (Prime95+Furmark, see screenshot). The system's power consumption: 58 watts. The clock rate increased to 2.7 GHz (constant) when Furmark (GPU load) was paused and the power consumption was stable at 52 watts. The 2.7 GHz correspond to the observations made in the multi core CPU benchmarks. 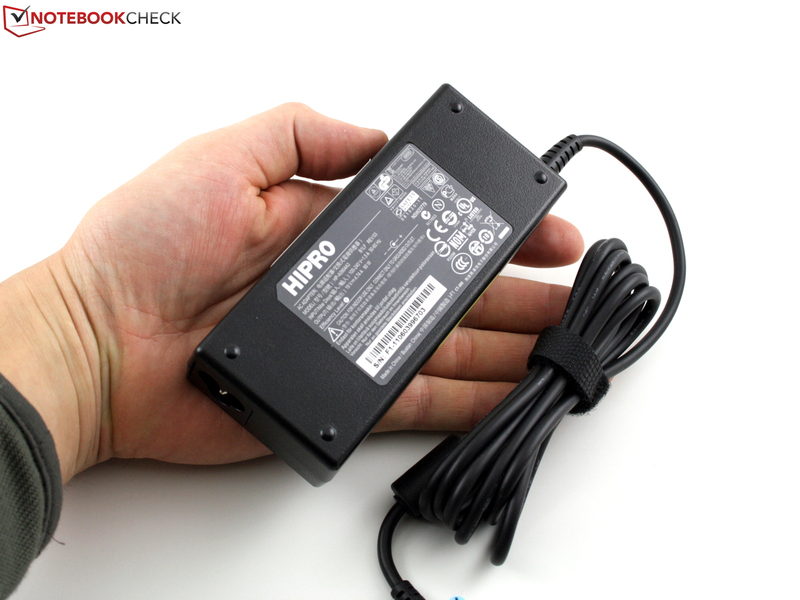 Because the 90 watt power adapter suffices for the power requirements and the temperatures of GPU and CPU stay within the green field, the only reason left for throttling is a security feature. However, gamers need not be deterred because we could only provoke the above described behavior in an extreme load scenario (stress test). None of the test games showed this irregularity. For example, a simultaneously executed Prime95 and OpenGL rendering test (Cinebench R11.5) couldn't induce throttling. (±) The average temperature for the upper side under maximal load is 33.3 °C / 92 F, compared to the average of 30.9 °C / 88 F for the devices in the class Multimedia. (+) The maximum temperature on the upper side is 37.5 °C / 100 F, compared to the average of 36.5 °C / 98 F, ranging from 21.1 to 71 °C for the class Multimedia. (+) In idle usage, the average temperature for the upper side is 27.8 °C / 82 F, compared to the device average of 30.9 °C / 88 F.
(±) The palmrests and touchpad can get very hot to the touch with a maximum of 37.5 °C / 99.5 F.
(-) The average temperature of the palmrest area of similar devices was 29.1 °C / 84.4 F (-8.4 °C / -15.1 F). The speakers emphasize the mids and trebles. The basses are neglected. Unfortunately, we noticed that the little membranes clearly hissed and scratched not only in high volumes. The speakers aren't located above the keys as you might presume, but underneath the perforated base plate (front). The speakers are unfeasible for music fans. Too bad because there are three big buttons on the keyboard's outer right for volume and mute. The long idle runtime (lowest brightness, energy saving mode) lets us presume low power consumption. The measurements confirm this, particularly in idle. The lowest power consumption ranges between 7.6 and 12.5 watts. These figures represent the minimum and maximum power requirement in idle (without battery charging). 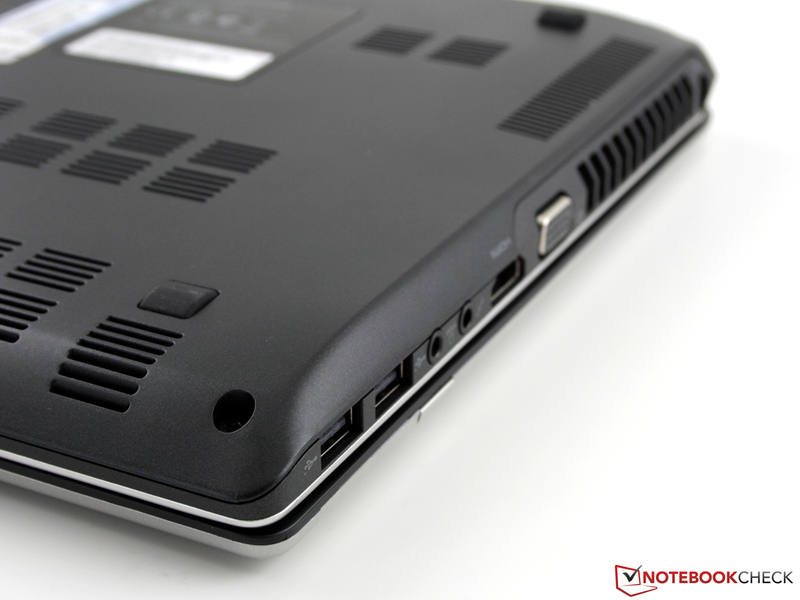 The EasyNote NX69 even stays frugal in the stress test (Prime95, Furmark): 58 watts. Merely a simple 3DMark 2006 needs more energy (68 watts). The reason is the CPU throttling (1.2 instead of 1.7 GHz) in the stress test, as described in "Temperature". Because the CPU throttles, the stress test is more "saving" than a 3D benchmark. The relatively big 90 watt power adapter (391 grams / 0.86 lbs) seems too big for the little notebook. But its capacity is just right because it allows the battery to be recharged during a 3D game (typically: 20 watts). Mobility fans can reckon with a practical battery runtime of up to 6:39 hours. This is how long it lasted in our WLAN surfing test (399 minutes). The TFT was set to a medium level of about 100 cd/m2. The NX69 was drained after 2:07 hours in CPU load (127 minutes, max. brightness). The maximum (idle) runtime of 11:40 hours (700 minutes) is beyond all expectations. This is the longest runtime that we have ever measured with a 60Wh battery (or smaller) and the i5-2410M. 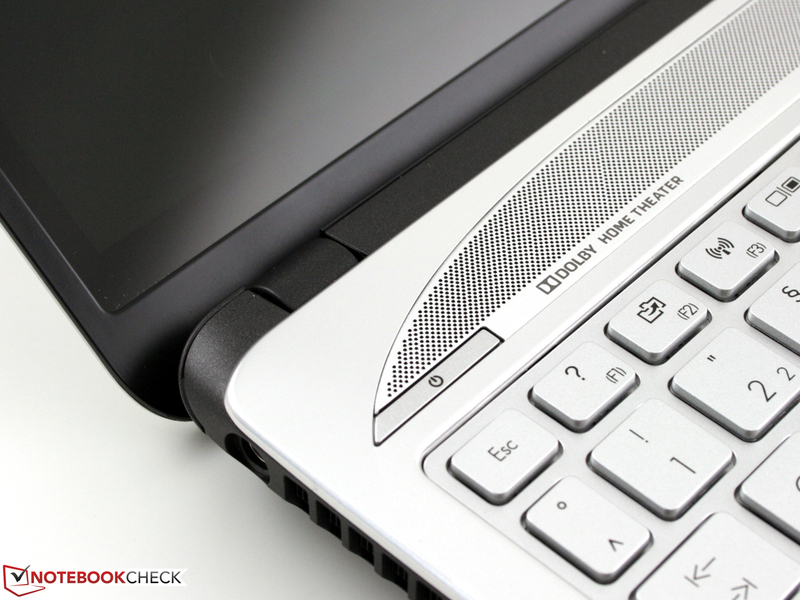 The HP EliteBook 2560p with 55 Wh and 600 minutes comes very close. The 14-inch competitor, Asus X43SV with an identical CPU/GPU, only manages 335 minutes (56Wh). 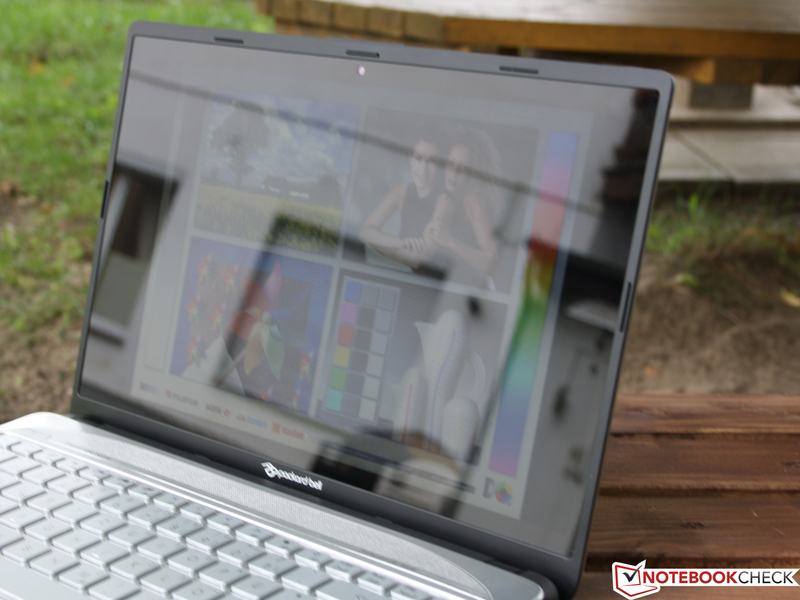 Packard Bell's EasyNote NX69-HR-127GE is a handy 14 inch laptop with clear strengths in material (quality surfaces, looks), performance and battery life. We find it remarkable, how high quality a chassis in an aluminum case can be for less than 700€ nowadays. The brushed and partly painted surfaces are joined to the plastic case with cleanly punched roundings. The Core i5-2410M's performance fused with a gaming suitable GeForce GT 540M meets our expectations. Thus, the 14 incher is fit for current games, often even in the native 1366 x 768 pixel resolution and high details. We could measure a runtime of 6:39 hours in the WLAN test despite the high performance. The NX69 can even rest on the shelf for 11:40 hours in idle. The only average bright display in a kind of edge to edge design however rules out constructive working in sunlight due to reflections. 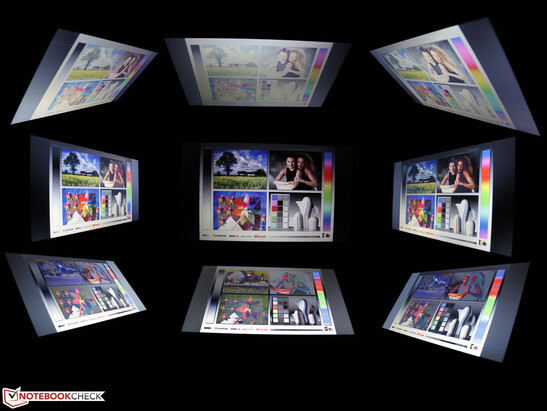 In terms of quality, the HD screen is a member of the mainstream category. The viewing angles are too small and we don't even want to mention the contrasts. 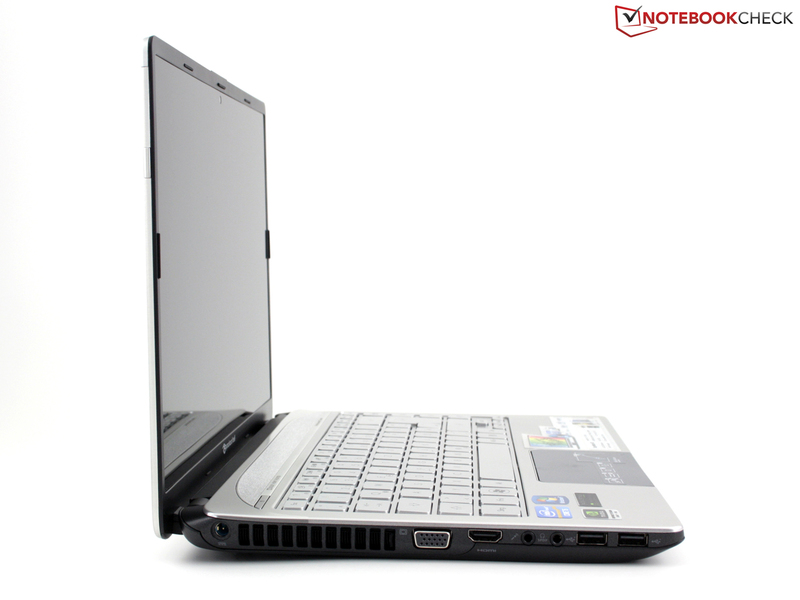 If you are looking for good performance (games) in the smallest possible, but presentable, case, you will be satisfied with Packard Bell's EasyNote NX69-HR-127GE. Since the configurations with a Core i5 and GeForce GT540M first start at 630€ in retail, the manufacturer is offering its hardware at a very low price. Compact alternatives (14 and 13.3 inch) would only be the Asus X43SV (GT 540M + i3, starts at 540€) and the Acer Aspire TimelineX 3830TG (GT 540M + i5, starts at 690€). The Das Asus N43SL (GT 540M + i5, starts at 650€) isn't listed in many shops yet, but should be equal, or even better in terms of workmanship quality. if he calls it a subnotebook or laptop. 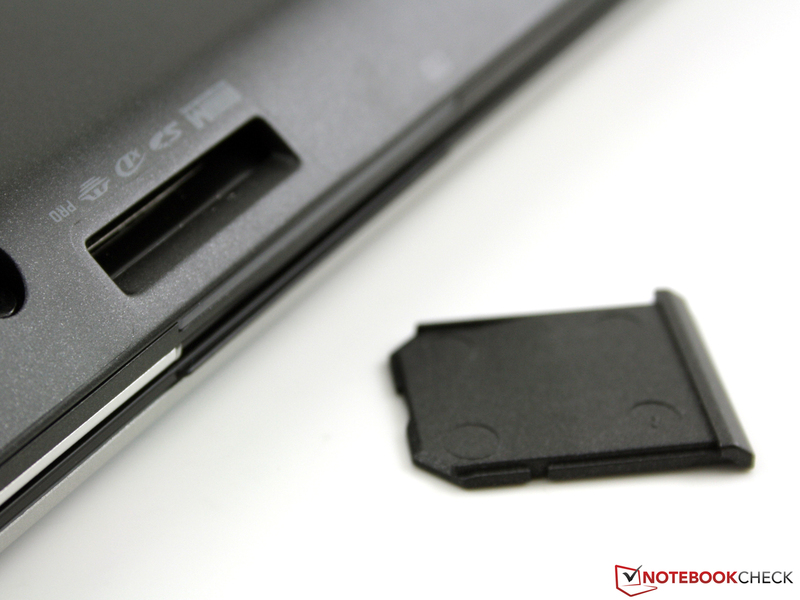 The card reader is located a bit unfavorably on the notebook's recessed front. The bottom doesn't have any maintenance openings. The battery and hard disk are permanently built in. Supplies: The mat is a mouse pad, keyboard cover and polishing cloth. There is no recovery data carrier in the box. The user has to burn it himself with the recovery tool. The 90 watt adapter looks very big. But it is really needed for the power consumption of up to 68 watts plus battery charging. 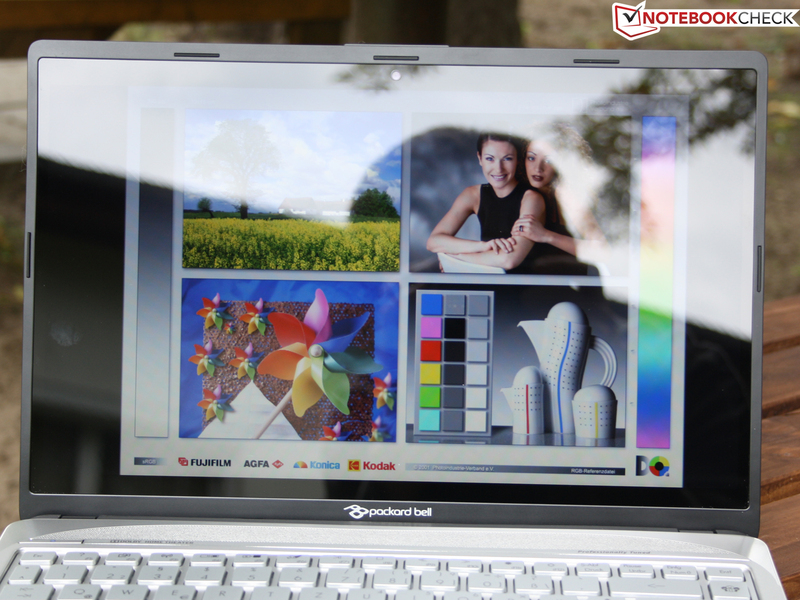 Packard Bell EasyNote NX69: The amount of high-quality surfaces and strong hardware you can get for less than 700€ is remarkable. 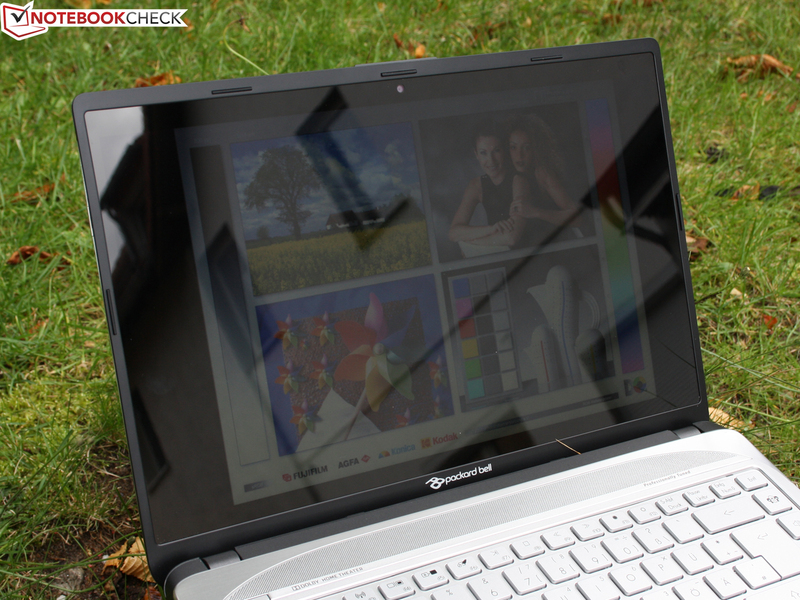 Packard Bell EasyNote NX69: The 14 inch screen with a narrow bezel is a real eye-catcher. The big surface is created by a kind of edge to edge plastic plate in front of the screen. The surfaces are partly smooth, brushed matt or anodized. The flawless forming of the aluminum parts is praiseworthy. 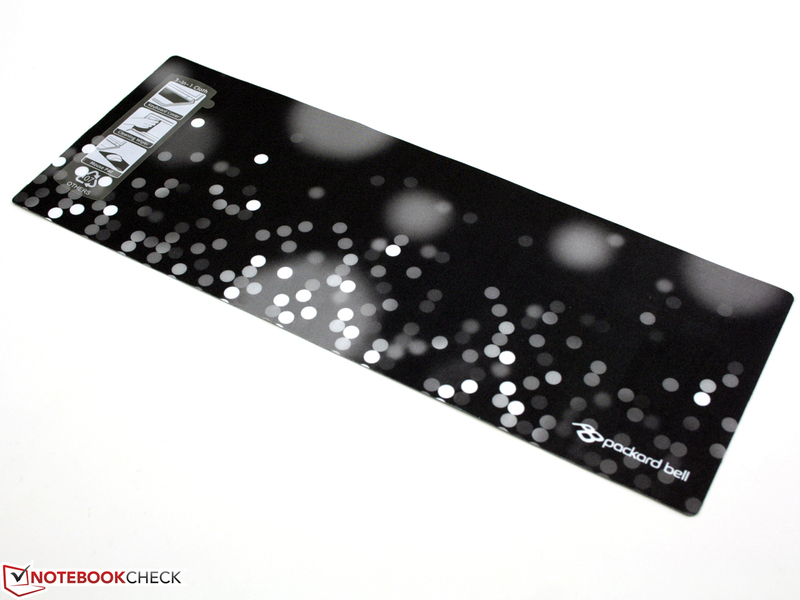 A rigid, transparent plastic plate covers the TFT and provides the homogeneous surface. from the Acer subsidiary, Packard Bell, don't often excel with technical highlights. 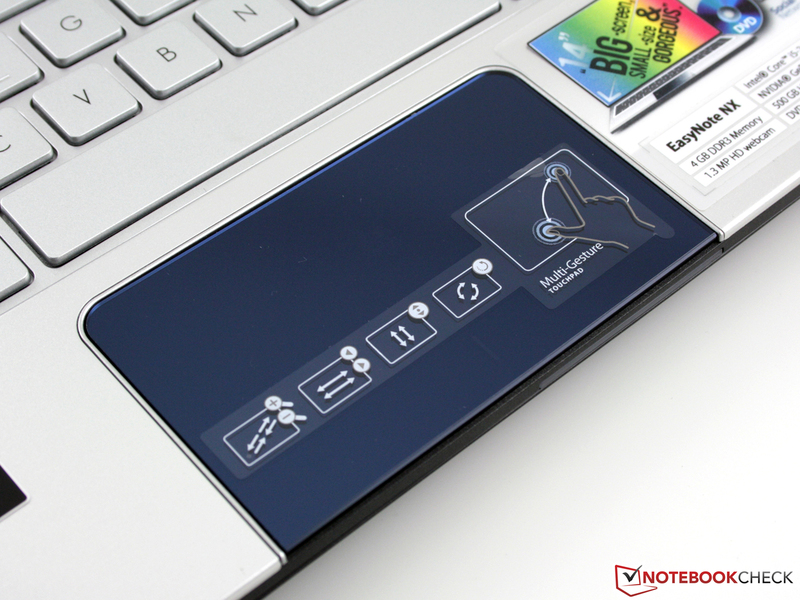 The EasyNote NX69 makes an exception with its extremely thin TFT bezel. It accommodates a 14 inch screen in a 13.3 inch case. 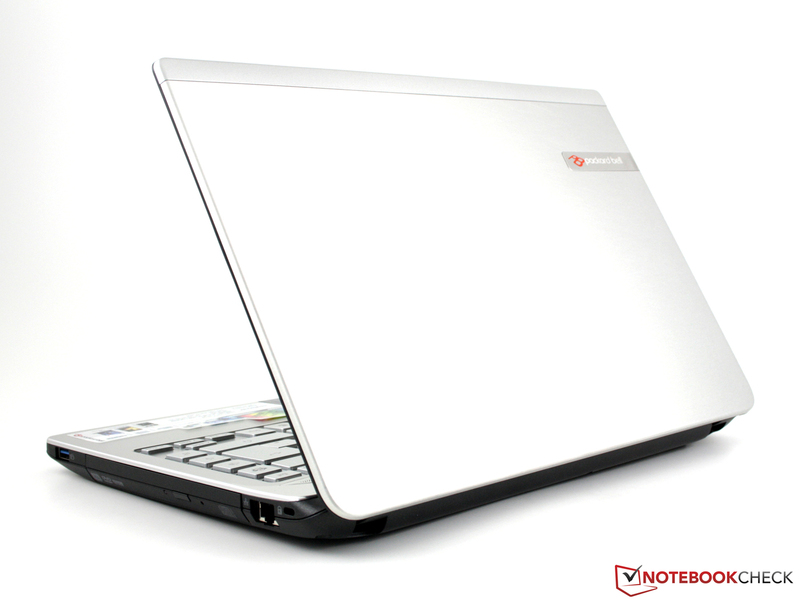 The stable notebook feels metallic cool and high quality due to its aluminum lid and wrist rest. Even the thin lid is surprisingly rigid. Nvidia GeForce GT 540M (midrange) and Core i5-2410M. However, the hissing speakers above the keyboard are deterring. The thin frame is an optical illusion. The image rendering screen doesn't reach up to the edges. 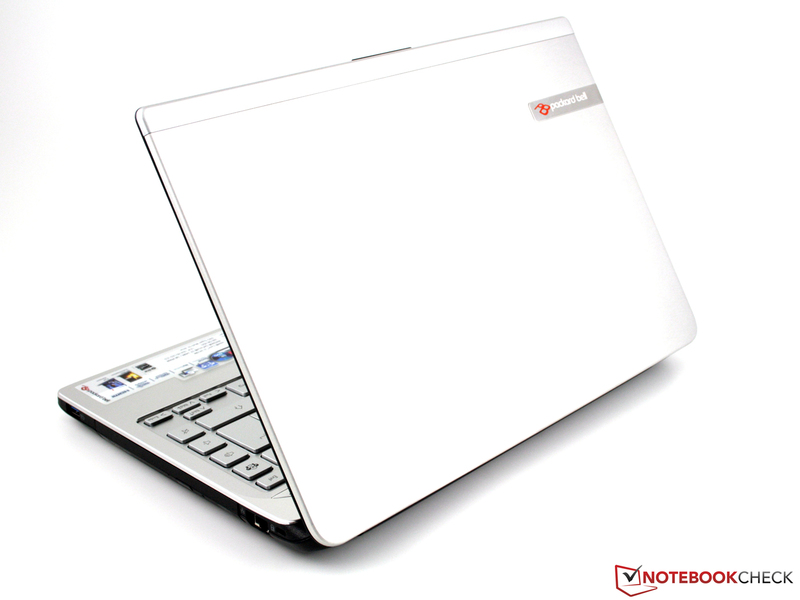 Packard Bell EasyNote NX69: High performance in the smallest room. Low waste heat and tolerable volume at relatively high performance. The high-quality, cool aluminum feel. If glare-type, then please with high color contrasts. The hissing speakers are unsuitable for music and games. A compact, solid case that even has room for an optical drive.